The Cardinals also swept the season series that year, taking down the Spartans 71-63 at Middleton on Dec. 19, 2015. Cardinals’ coach Kevin Bavery was particularly pleased how his team responded after Memorial won at Middleton, 60-34, on Dec. 7. “We were pretty steady the whole game against a team that beat us by 26 at Middleton,” Bavery said. “We couldn’t stay with them in that game. Middleton used an aggressive defensive effort and some clutch free throw shooting to turn the tide against the Spartans and win for the third time in the last four games, while dealing Madison Memorial its fourth loss in a row. The Cardinals mixed in a 1-3-1 zone with a tenacious man-to-man effort to keep the Spartans in check for most of the game. Both teams opened the game with deliberate attacks. Memorial ran more than a minute off the clock on its initial possession, while the Cardinals didn’t attempt a field goal for nearly 2 minutes. Thomas drained a three-pointer to open the scoring and set the stage for a first half that saw three ties and five lead changes. Klubertanz said Thomas provided a spark to get the Cardinals going on both ends of the floor. Thomas and Boyle scored six points apiece in the first half, while Klubertanz added five for Middleton. The Cardinals sank 8 of 16 field goal attempts and 3 of 6 from beyond the arc. Meanwhile, the Cardinals’ defense held Memorial to 37.5% shooting (9 of 24), including 4 of 12 (33.3%) from 3-point range. Middleton outrebounded the Spartans, 19-7, in the opening half, but the Cardinals committed nine turnovers to none for Memorial to keep the game close. Boyle’s old-fashioned three-point play gave Middleton a 21-20 lead with 1:07 remaining before halftime. But Memorial senior guard Cade Ellingson sank a layup off an inbounds play with 2 seconds remaining to give the Spartans a 22-21 lead at the break. Middleton took the lead for good at 25-24 on Boyle’s driving layup 2 minutes into the second half. Madison Memorial kept it close behind Ellingson, who scored 13 of his game-high 19 points in the closing 12 minutes of the game. The Cardinals did hold sophomore guard Kyle Yu, who scored 12 points in the teams’ earlier meeting, to just three points on one second-half trey. Thomas, who picked up his third foul in the opening minute of the second half, sank two free throws with 4:57 remaining to give Middleton its largest lead of the game at 49-40. Thomas, who eventually fouled out with 1:40 to play, took turns defending Ellingson, whose two free throws with 2:27 remaining pulled the Spartans within 52-48. But Klubertanz sank two free throws, senior forward Ben Scher made one of two at the line, and Klubertanz added two more foul shots to push the lead to 57-48 with just more than a minute to play. Middleton shot a sizzling 75 percent from the field in the second half (12 of 16). The Cardinals outrebounded the Spartans, 31-16, and also shot 63.6% at the line (14 of 22) for the game. Scher, who came off the bench to score five points – all in the second half — provided the dagger when he rebounded a missed free throw and sank a layup to cap the scoring. 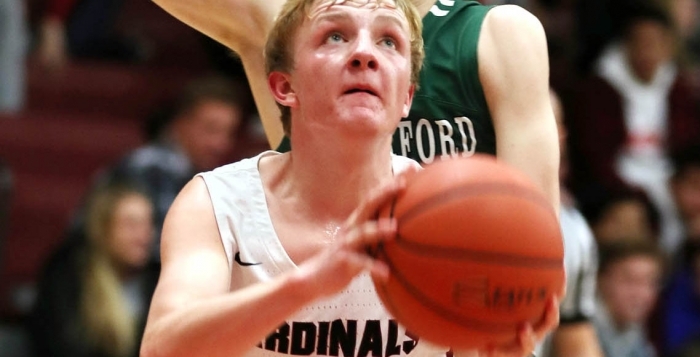 Bavery lauded the play of the Cardinals’ reserves that included key contributions not only from Scher, but also junior Henry Patterson and seniors Casey Hellenbrand, Keegan Severn and Wyatt Wirkus. “That’s important when you have a long, grinding game like that,” Bavery said. Thomas said the Cardinals were determined to end the Spartans’ winning streak against Middleton and provide a glimpse of the team’s postseason potential. “This is the game that we needed,” Thomas said. “But it wasn’t just me. It wasn’t just Jack and Jake. It was the guys on the bench who didn’t play. It was everybody. MIDDLETON — Chandon Thomas 6 3-4 18, Sam Close 3 0-0 7, Jack Boyle 3 4-5 11, Jake Klubertanz 4 6-9 14, Parker Van Buren 2 0-2 4, Henry Patterson 1 0-0 2, Casey Hellenbrand 0 0-0 0, Wyatt Wirkus 0 0-0 0, Keegan Severn 0 0-0 0, Ben Scher 2 1-2 5. Totals 21 14-22 61. MADISON MEMORIAL — Cade Ellingson 7 5-6 19, Logan Younk 1 0-0 2, Nick Caropreso 5 0-2 12, Dryden Schaefer 2 1-3 6, Kyle Yu 1 0-0 3, Daemiontae Bates 1 2-2 5, Kwan Lewis 0 0-2 0, Ian Brown 1 0-0 3, Justin Jackson 0 0-0 0, JR Mitchell 0 0-0 0, Drew Collins 0 0-0 0. Totals 18 8-15 50. 3-point goals — M 5 (Thomas 3, Close 1, Boyle 1), MM 6 (Bates 1, Brown 1, Caropreso 2, Schaefer 1,Yu 1). Total fouls — M 16, MM 21. Fouled out — Thomas (M).